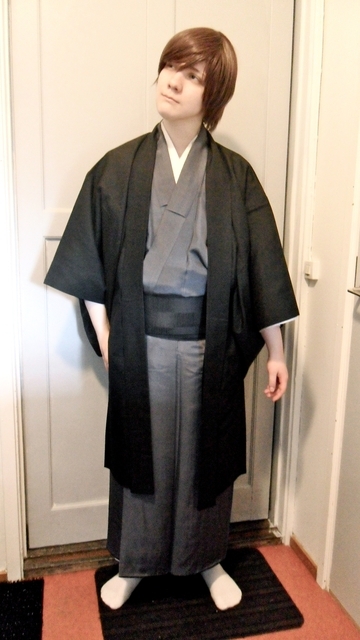 Shiro Samurai's Cosplay: Quick Kazuma preview + I now live in Sweden! Quick Kazuma preview + I now live in Sweden! First off I must mention something not-so-cosplay-related but which still affects my cosplay hobby in some ways and yes, it is also important; I moved away from home the 1st May and currently live in a very small youth apartment in northern Sweden, not far from my mom's place (read: former home) in Finland. That also means that a chunk of my cosplay posts from now on, if done in my apartment, will have a semi-crappy background. I will try to do photoshoots and such at mom's place every now and then because the yard there is great as a background.. but I guess most quick previews, contact lens try-ons etc from now on will be photographed at my apartment so yeah, I'll apologize for future messy backgrounds and yellow lightings in advance. I will try to check though if there's any cool photoshoot locations close to my new apartment. :) Oh, and about the cosplay making itself I'm pretty sure I will continue to work on my cosplays at mom's place because the good sewing machines are there as well as all crafting tools and stuff. I can't really bring much stuff to my apartment because the space is very limited..
anime conventions/events as long as my economy allows it. 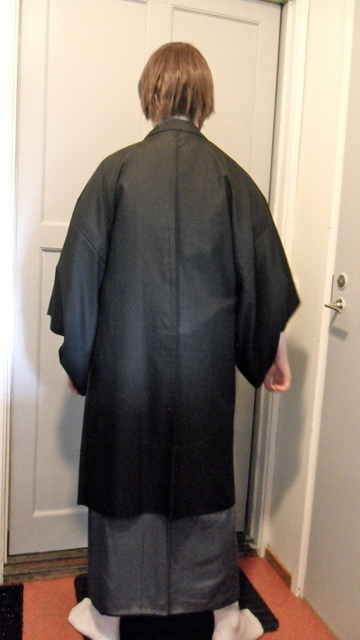 Oh well, I decided to do a super quick Kazuma cosplay preview sort of thing today. I didn't bother with any make-up and yeah.. now comes the yellow lighting and semi-crappy background for you all to enjoy.. not. ._. Also ignore my non-tabi socks and that I'm not wearing zori.. I will of course have the proper footwear at Desucon. I forgot to mention that all the items for this cosplay (kimono, juban, haori, kaku obi) are from my kimono hobby closet and by that genuine Japanese pieces. This hairstyle doesn't look very good on me I think; my photographer had to take quite a bunch of photos before getting anything I was at least semi-pleased with... oh well. Not so much more to say about my Kazuma cosplay, it's awaiting its debut now. I will try to do a Rokuro Unno (Brave 10) preview later too. I'm glad that you will still attend to both finnish and swedish cons! 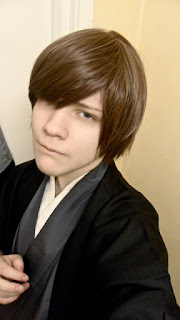 :D Good work with that kazuma cosplay, suits you well! :D Miks kommentoin sun blogiin välillä englanniks ja sitten taas suomeksi?XDD who knows... Niin oot siis edelleen tulossa desuun? I'm excited to see your Rokuro Unno preview!